* Share price as of close on April 1, 2015. Shares outstanding as of end of most recent quarter and exclude treasury shares. This Bridge Report provides details of Nihon Enterprise Co., Ltd. and information pertaining to earnings results for the third quarter of fiscal year May 2015. Nihon Enterprise claims to be a "mobile solutions company," with two main business segments. One is the mobile content segment, where various contents including lifestyle and traffic information services are created and distributed to smartphones and other mobile devices. The other is the solutions business segment, where contents creation and operations, system integration, advertising business (In-Store affiliate), reverse auctions, IP phones and other solutions (Cost reduction) are provided. Furthermore, Nihon Enterprise is also promoting efforts to expand its business into overseas markets, and has been a frontrunner among Japanese content providers operating in China and India. Nihon Enterprise's operation is based on its unique business model of developing its contents in-house, and thereby owning rights to such contents in-house (which will ensure high profitability). Combining this business model with performance-based content distribution (an independently developed real affiliate program) in addition to cooperation with cellular telephone retailers, the Company has been successful in boosting content sales. The Nihon Enterprise Group is comprised of eight consolidated subsidiaries, namely Dive Co., Ltd., which provides advertising business, at the LOUNGE Co., Ltd. which provides music related services, Advanced Traffic Information Services Corporation (ATIS Corp.), which provides traffic and other information services, 4QUALIA Co., Ltd., which provides web and mobile site development and maintenance services and contents development, HighLab Co., Ltd., which conducts native application development as part of the mobile contents business, Enterprise (Beijing) Information Technology Co., Ltd., which operates cellular telephone retail shops in addition to business management in China, Beijing YZH Wireless Net Technology Co., Ltd., which provides mobile contents planning, development and distribution, and Rice CZ (Beijing) New media technology Co., Ltd., which provides IT related educational services. The Group also boasts of another four non-consolidated subsidiaries, namely and One, Inc., which provides voice communications related solution services, Aizu Laboratory, Inc., which provides smartphone application planning and development, Rice MC (Beijing) Digital Information Technology Co., Ltd., which provides mobile contents distribution and character licensing services, and NE Mobile Services (India) Private Limited, a local company operating in India. "Beauty rhythm for women" supports both mental and physical health for women. Predicts menstrual and ovarian cycles, provides effective advice on dieting by using users' thin period, diagnosis for stress, and various menus specifically for female users (dmenu, au Portal, SoftBank, au Smart Pass, App Cho Hodai, Feature Phone). With regards to the contents services business, Nihon Enterprise will endeavor to fortify its earnings structure through the provision of contents to carriers' authorized fixed rate services along with global deployment of "contents platforms" through mutual collaboration between native applications*, including primarily games, and messenger applications. At the same time, consigned development for smart devices, business support services, advertising (Storefront affiliate) and collaborations (Alliance type) are expected to become the growth drivers for expansion in the solutions business. * Native application is application which can be downloaded to and run on smartphones and other digital handsets. Previously, browser applications (i.e. Internet service provider's server) had been used by feature phones because of their inability to download applications. Applications for smartphones provided to carrier fixed rate services and carrier official site monthly subscription services trended favorably. Consequently smartphone sales accounted for 69% of segment sales during the third quarter. Currently, applications are provided across the carrier fixed rate services including "au Smart Pass (KDDI)", "Sugo Toku Contents (NTT Docomo)", "App Pass (Softbank Mobile)" and "Appli Chou Houdai (Source Next)". The current growth in sales is expected to continue on the back of the addition of contents and through provision across new fixed rate services. The largest volume of contents is provided through the fixed rate service of "au Smart Pass", which was one of the first platforms used, and more popular contents are also expected to be provided across "Sugo Toku Contents" and "App Pass". During the third quarter (December to February), new functions were added and collaboration with game applications was conducted, along with implementation of overall improvements in quality as part of the fortification of "Fivetalk". Furthermore, efforts to create a new business model and collaborate with games for female users have been conducted for "Woman's DIARY". "Uchi No Danna Ha Iketenai"
Consigned development of applications for smart devices, business support services, advertising (Real affiliate) and collaboration (Alliances) are expected to become growth drivers of the solutions business. The realm of businesses related consigned development for smart devices, includingBYOD, messenger services, telemarketing, IVR (Intelligent voice response), IP telephone, smart grid, big data, and IoT, is expected to expand. At the same time, business support services are expected to be focused upon the three main realms of corporate messenger applications of "BizTalk", internal phone system function applications exclusively for smartphones "AplosOne Softphone", and reverse auctions (Purchasing support system) "Profair." In advertising (Real affiliate), Nihon Enterprise is cultivating new collaborative partners with a view to continuation rates from the second quarter (September to November) onwards. The Company will endeavor to continue increasing sales by expansion of touchpoints (number of stores) and to improve advertising values by lowering churn rate. ¥1.225 billion in sales were achieved during the third quarter (December to February). While sales of individual contents varied in the contents business (An unavoidable characteristic of this business), all of the sub-segments of the solutions business, including solutions, advertising (Storefront affiliate) and overseas, were able to see growth in sales over the second quarter (September to November). Operating income of ¥52 million was recorded. Increases in advertising within the solutions business contributed to an increase in cost of sales margin, in addition to increases in both development and advertising expenses in the contents business and led to a shortfall from the ¥95 million in operating income recorded in the previous third quarter. However, advertising expenses are appear to have peaked out and operating income rose from the ¥10 million recorded during the second quarter. Sales are expected to rise by 14.1% year-on-year to ¥3.740 billion. Sales of advertising (Real affiliate) doubled and acted as a growth driver of the solutions business, allowing its sales to rise by 26.5% year-on-year to ¥1.829 billion. In addition, sales of the contents services business also rose by 4.4% year-on-year to ¥1.911 billion on the back of an expansion in contents provided to carrier fixed rate services. Operating income, on the other hand, declined by 55.0% year-on-year to ¥114 million due to a 0.6% point decline in gross margin arising from a 48.0%, increase in advertising (Storefront affiliate) sales relative to overall sales and increases in development and advertising expenses (From ¥337 to ¥582 million), which caused sales, general and administrative expenses to rise by 25.8% year-on-year to ¥1.680 billion. Net income exceeded ordinary income due to the booking of ¥331 million in extraordinary income arising from the sale of marketable securities (Exceeded the previous year's level of ¥516 million). Provision of various contents was started to carrier fixed rate services, including "Leisure and Parking Information" to Sugo Toku Contents (NTT Docomo), "Beauty Rhythm for women" and "Stamp Tukuri Hodai" to App Cho Hodai (Sourcenext), and "Couple Note" to App Pass (Softbank Mobile). Efforts to cultivate sales partners for the internal telephone system application "AplosOne Softphone" and the corporate messenger application "BizTalk", and capture demand for consigned work during the March year end period were successful. Nihon Enterprise procured over ¥1.0 billion in capital through the issuance of new shares (¥853 million) and a third party private placement (¥153 million). Consequently total assets rose by ¥622 million from the end of the previous fiscal year to ¥6.163 billion at the end of the current third quarter. In addition, the capital of consolidated subsidiaries was also increased (HighLab: ¥0.2 billion, 4QUALIA Co., Ltd.: ¥0.1 billion). Sales are expected to rise by 13.8% year-on-year to ¥5.130 billion on the back of favorable trends in contents provision to carrier fixed rate services and advertising (Storefront affiliate) services, and due to progress in the delivery of consigned development work. However, higher development and marketing promotion expenses arising from native applications are expected to cause operating income to decline by 34.4% year-on-year to ¥220 million. Declines in profits on the sale of investment securities are expected to cause net income to fall by 58.8% year-on-year to ¥180 million. Also, the issuance of new shares and a third party private placement conducted from December 2014 to January 2015 are expected to depress net income per share a step further to ¥4.63 per share (¥11.59 per share in the previous term). Moreover, advertising expense is expected to rise by ¥124 million from initial estimates of ¥600 million to ¥724 million (¥515 million in the previous term). The commemorative ¥1 dividend will be eliminated, and the normal dividend is expected to be raised by ¥1 per share for a dividend payout ratio of 67%. Achievement rates of the full year estimates for sales, operating income and ordinary income stood at 72.9%, 52.2% and 54.8% respectively at the end of the third quarter (The booking of extraordinary income from sale of investment securities allowed net income to achieve 108.3% of estimates). Progress in delivery of consigned development is expected to allow sales to achieve its full year estimate. At the same time, Nihon Enterprise can be expected to achieve its operating and ordinary income estimates if it restrains advertising expenses. However, fiscal year May 2015 is identified as a stage to prepare for future growth, and Nihon Enterprise is expected to prioritize investments for future growth at the expense of achieving its profits estimates. 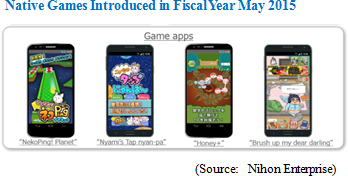 Sales of smartphone games (Native games) is expected to have grown by 20% to ¥658.4 billion in 2014 by research companies based upon the total smartphone numbers of 60 million within Japan, and sales are expected to exceed ¥800.0 billion in 2016. Consequently, a close watch should be paid to Nihon Enterprise's ability to convert the growth in the market to growth in its earnings.